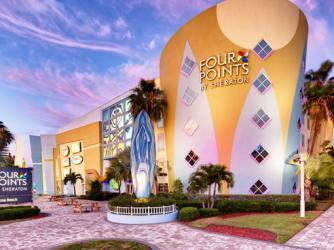 Located in world famous Cocoa Beach, Four Points by Sheraton Cocoa Beach is only steps from the widest beach in Florida. Guests can not only expect beautiful views of the ocean but smoke free accommodations, 32" televisions with pay per view and game console, Four Points by Sheraton Four Comfort Beds, free Internet service, free local calls, microwave ovens, coffee/tea service, and refrigerators. While not in your room, shop in the world's Largest Surf Complex, Cocoa Beach Surf Company (TM) or relax in the casual Shark Pit Bar & Grill, with a 5,600-gallon shark & exotic fish aquarium and 40-foot water wall. A Starbucks Coffee Shop is also located inside. Located only 45 minutes from Orlando International Airport, 20 minutes from Kennedy Space Center, 20 minutes from Melbourne International Airport, and a 5 minutes from Port Canaveral's cruise and gaming ships.